It is a heavy, difficult world. What wisdom is there in taking things lightly? I was gobsmacked. Aside from being a rather vitriolic response to a request to write a three paragraph essay on a children's book writer, it stirred up an annoyance and a curiosity in me... was he right? Is whimsical art worth it? Must all art, as Jeremy Begbie once wrote, contain the Triduum (the death of Good Friday, the silence of Holy Saturday, and the resurrection of Easter) to be truly useful or Christian? Is whimsical art good? Useful? Neutral? Is it bad art? Bad for us? Whimsy helps us recognize the intrinsic goodness of life, which energizes us to protect that goodness. Let’s look at the work and life of three artists who passionately exhibited this whimsical love of life. Gilbert Keith Chesterton (1874-1936) was a journalist, writer, poet, dramatist, and "Prince of Paradox." 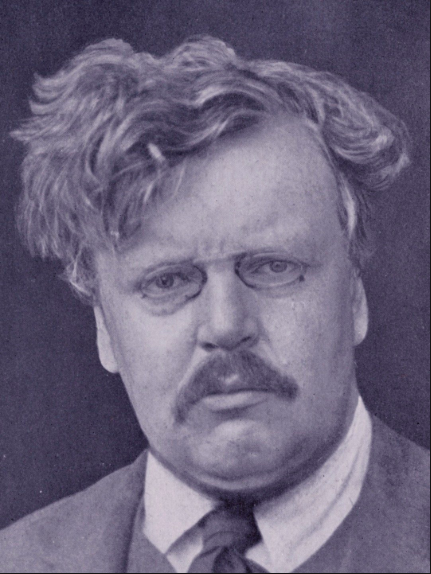 Chesterton was born to a loving, creative, and agnostic family. At the Slade School of Art, Chesterton suffered something like a mental breakdown, in which he admitted to becoming morbid and nearly suicidal. Emerging from that slump, he began a search for truth, for reality. He credited his life-long love and wife, Francis, for bringing him to faith. Whatever the circumstances of his conversion, Chesterton's faith was characterised by a profound hilarity. Fun fact: He was an ENORMOUS person, standing at around 6'4 and weighing nearly 300 pounds. His larger than life persona matched his larger than life body. Chesterton thought that one of our greatest problems is that we take the wondrousness of life for granted, and that we give in to cynicism. What Chesterton is advocating here is not a fluffed up version of reality, seen through rose colored glasses, but an appreciation of the strange givenness of reality. Regarding this idea, my friend Boze wrote me saying: I've been re-reading the introduction to The Annotated Alice, where he talks about Carroll's effect on Chesterton and how, seen from one way, the world is a nightmare, and seen from another way, the world is a miracle. and how nonsense literature captures the strangeness of the world like nothing else does... I've been revisiting the stories of Ray Bradbury and realizing just how much that man shaped my worldview. he was in love with the humanities and books and art and fantasy and Hallowe'en and believed they had real power to transform the world for the better, and that the modern world was suffering from a suffocating lack of fantasy and imagination. there was a line that when I read it in one of his short stories reminded me of you - the hero of this story built a giant mansion on Mars and filled it with mechanical replicas of characters from books that had been banned on earth. and when someone asked him why he was going through all the trouble he said, "It was enough just to be able to create this place. To be able to say I did it. To say I nurtured a medieval atmosphere in a modern, incredulous world." isn't that just perfect? " Whimsy turns the world upside down so we can love and cherish it when it is turned right side up. It helps us cherish what is good. Chesterton puts his philosophy to work in his strange, delightful and ridiculous book Manalive. This book is about Innocent Smith, a strange man who floats into a London parlour like Marry Poppins. His arrival, his strange sayings, and his games precipitate romances, delights, reforms, and reconciliations. But, suddenly, a startling revelation comes about: Innocent is a thief, and adulterer, and a murderer. Can it be true? What comes to light is that Innocent stole his own things that he might come to value you them, he had affairs with his own life, he put a gun to someone's head that they might not want to die. Innocent turns the world upside down so that, right side up, he can accept it all as a strange, wondrous gift from God. A free version of "Manalive"
whimsy helped chesterton know the true value of the ordinary things. this emboldened him to be a bold defender of what was good in the world. Chesterton was known to be something of a radical politically. I think his whimsy, his love of the wondrousness of the world is what shaped his radical opinions. 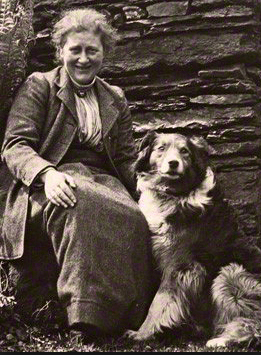 Beatrix Potter (1866-1943) was a woman whose love of the ordinary, odd, and whimsical lead to her fierce defence of them. She was raised in isolation by a wealthy family. Not having many friends, she spent her days drawing and painting the flora, fauna, and wildlife in the beautiful places she lived. 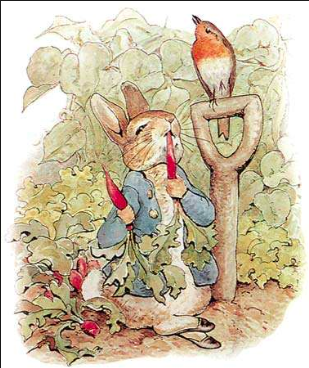 To the shock of everyone in her life, her self published "bunny book," The Tale of Peter Rabbit (1902) became a swift best seller, selling 56,470 books in the first year. She had a keen business mind, and managed her funds very well. She continued to publish her books and save her money. She eventually bought Hill Top Farm, in the Lake District of England, to escape her fraught relationship with her mother. Perhaps her greatest accomplishment of all was her preservation of large tracts of the Lake District. Having an enormous amount of money, and being an industrious woman, Beatrix began to look for productive ways to spend her money. The industrial revolution had already spent years spewing black smoke onto the land she loved, so preservation came to mind. She became the disciple of Hardwicke Rawnsley, an Anglican priest, poet, hymn writer, and preservationist. 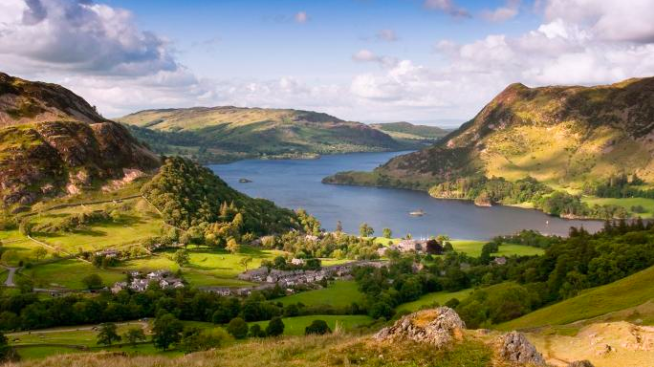 He encouraged her to use her funds to preserve the Lake District from industrial development. By the time of her death, she had purchased 4,000 acres of land and 14 farms, which she gave to the National trust. Those farms still exist today. You can find out more about her work with the preservation trust here. I visited with my dear friend elena... the views will take your breath away. Here we are at Hill Top... Beatrix's home! 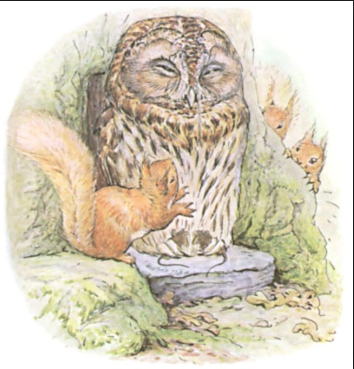 I wish I could ask Beatrix about her artistry... did her whimsy inspire her preservation? Breezy is an illustrator and I'm waiting for her first NYT bestseller. Talk to me about your artistry... When I go to paint something, I almost always have a very clear idea of what it’s going to be and I just have to make it. Before I get to painting, I’ll start with a couple pencil sketches to be sure I know what I’m going to do and can feel what kinds of colors I’ll want to use. I usually sketch the people’s expressions only once so I don’t lose the energy of what I first imagined. I love using watercolor because it forces you to think and move quickly. It keeps me on my toes which adds to the fun of it, and watercolor shouldn’t be overworked anyway. Once I get started I like to clip along and can’t wait to see how it ends. What inspires you? So much of my art is inspired by this kind of dream world in my mind, made up of the towns and landscapes that I’d see in children’s books growing up. It’s a mix of Avonlea, The Hundred Acre Wood, and The Jolly Postman’s fairy tale village. I’ve always loved the feeling I’ve gotten from them, and want to give that same feeling to others. 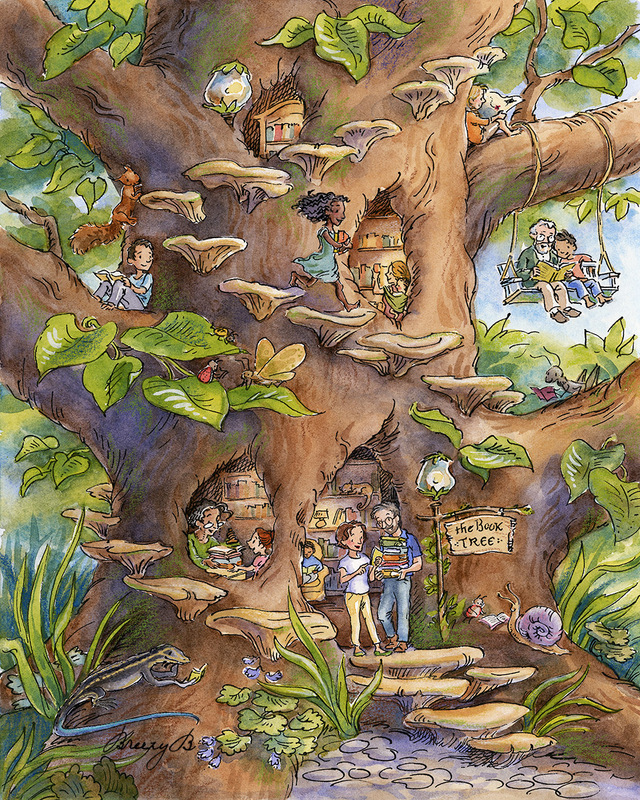 With this particular piece (The Book Tree), my inspiration was the hours upon hours of my childhood spent in children’s books, going on walks through my Granny’s woods or hunting for tadpoles, and the weekly highlight of taking home a giant stack of books home from the library. What do you think the value of beauty and whimsy is in a difficult world? Beauty reminds me that there’s something greater beyond what’s right in front of me. Beauty and whimsy lighten our hearts and help us to dream. It could be anything—a painting of a sunlit cottage, a ballad about a knight fighting a dragon, a postcard with a whimsical bird on it—it reminds me that my current situation isn’t the end of my story or the point of my existence, that God still has good for me. It tells me that the universe is a dance designed by a loving God. We become jaded easily and need to know that even when things seem dark and endlessly difficult, there is still joy to be had. Here is the piece she mentioned! Friends, you really must go peruse, buy, and support Breezy's art. Find her on Instagram (my favourite!). And find her on Etsy. her music manages to hold the heaviness and the lightness of life together. she treats things lightly so we can understand their gravity. This song is whimsical if it is anything. Nonsense words, lines strung together by nothing but rhymes, and all prefaced by the instructional words "This is how it works." Just like Chesterton, Regina uses whimsy to remind us that life is much like a fairy tale in that the rules of life can seem arbitrary (like the rhyming first verse), yet in the midst of the apparent absurdity, there seems to be so much goodness, meaning, and love. Regina uses whimsy to remind us of the goodness and strangeness of life. Can whimsical art be good art? Can it capture aspects of reality? Can whimsical art be good for us? Speaking with Joy is now a featured podcast for the Anselm Society. The Anselm Society wants to see an renaissance of the Christian Imagination in the church. Conversation. We publish written resources, host podcasts, organize events(notably the Your Imagination Redeemed conference), and bring together thought leaders to inspire and educate pastors, artists, and the laity to better work together to form the Christian imagination. In my time in Colorado, I’ve had the pleasure of being involved with their ministry, and I gained a lot from the events and conversations they cultivated. Check out their website, the other podcasts, and all the written resources they have! I’m pleased as punch to be an Anselm Partner! Make sure to check out their work.